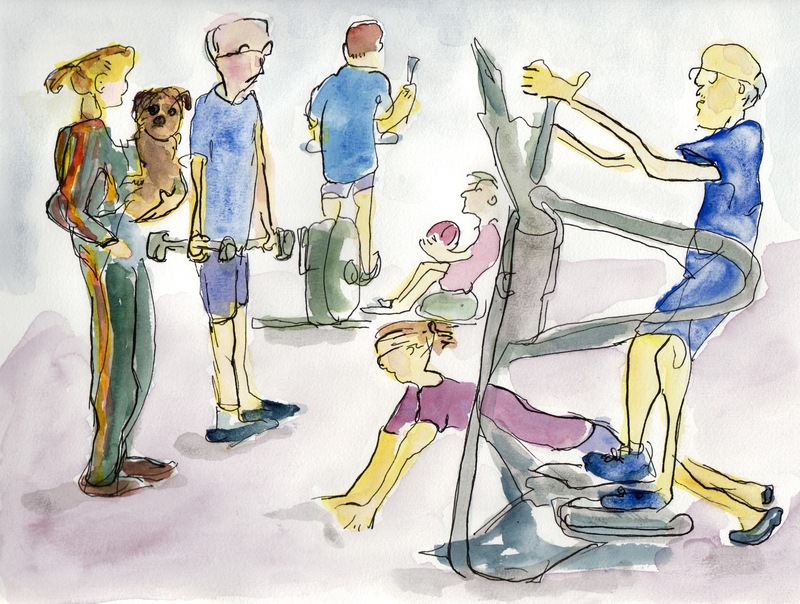 I sketched this evening at our little gym and tried to capture the essence of what happens there in an hour. I wanted to convey a bit of what the different figures may be feeling along with showing motion. Our trainer sets a tone of urgency and the rest of us do our best to live up to her expectations-most of the time. The trainer who is bundled up and feeling cold, is the most relaxed and I tried to show this by having her stand casually and hold her dog. The five enthusiasts are all are putting effort into the exercise and as a result are much warmer than the trainer. At least one of the participants may be wondering just how much longer the class will last. Between last week’s sketch from the gym and this week’s I am not showing growth in my goals for deliberate practice this week- showing motion and showing feeling. As I look through the five quick sketches I did in the hour, I notice that the more I include in a sketch, the harder it is to get a final sketch that achieves my practice goals. So perhaps I need to simplify the composition somewhat. I sketched with an ink pen at the gym and later added the watercolor wash at home. This entry was posted in Groups Interacting. Bookmark the permalink.